Maquoketa River running through Lake Delhi. 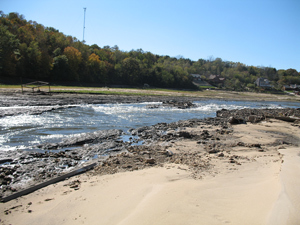 Governor Culver signed a proclamation Wednesday designed to accelerate work in eastern Iowa to control erosion at Lake Delhi, which was drained by a dam breach in July. The move allows state and local agencies involved to speed up the bidding process. Kevin Baskins with the Iowa Department of Natural Resources says tons of sediment accumulated on the bottom of the man-made lake over eight decades. It’s now being pushed downstream on the Maquoketa River. “The river channel is quickly eating away that sediment, so we’re trying to get something in there to stabilize the sediment on what was the bottom of the lake,” Baskins explained. The project is expected to cost $800,000 and be completed by the end of October. Baskins says the sediment is being eroded away must faster than originally thought. “It’s also very unpredictable. You can go there today and it may look different than what it looked like last week,” Baskins said. “So, we really felt if we’re going to get control of it, we need to act as soon as possible.” The Maquoketa River is a prime area for smallmouth-bass, particularly below the former Lake Delhi Dam. Baskins says biologists are concerned the dirty river will hurt spawning. 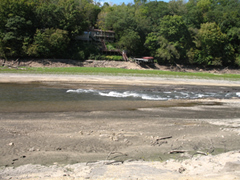 “When you get this kind of sediment moving downstream, it definitely hampers the aquatic life,” Baskins said. A task force has been assigned to study how the Lake Delhi Dam might be replaced. A report is expected by December 1.